These Light-Up Customized Plastic Sampler Glasses offer a fun, unique way to showcase your logo and message. Customized Plastic Sampler Glasses are great for promotions, special events, bars, restaurants, clubs, and many other organizations. Our Lighted Plastic Sampler Glasses are made of durable clear styrene to ensure long use. Lighted 3 oz. Wine Sampler Glasses, Lighted 3 oz. Martini Sampler Glasses, and Lighted 6 oz. Cups are available. The Plastic Samplers feature continuous-on and blinking light effects, which you control with a push of a button. Each Custom Light-Up Plastic Sampler Glass features your logo and message in the imprint color of your choice. We offer a wide range of standard imprint colors, as well as PMS-matched colors. Standard production time is about two weeks after proof approval. Your satisfaction is guaranteed when you order Custom Imprinted Plastic Glassware from us. BWS13 NEW! 3 oz. Blinking Stemless Wine Glass (clear with colored light) N/A 2.45 2.17 2.07 1.95 1.85 1.31" 1.25"
BMTS13 NEW! 3 oz. Blinking Stemless Martini Glass (clear with colored light) N/A 2.45 2.17 2.07 1.95 1.85 1.25" 1.00"
BCR16 NEW! 6 oz. 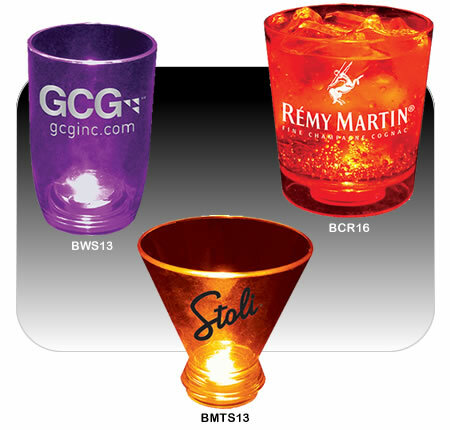 Blinking Rocks Cup(clear with colored light) 3.49 3.07 2.93 2.85 2.69 2.63 2.75" 2.75"
It's easy to get started with your Light-Up Plastic Sampler Glasses – simply call 1-800-233-0828, and then e-mail your camera-ready artwork to graphics@kardwell.com (you can also mail your design). Production time is about three weeks. Rush delivery is available for an additional charge.